We clicked with Giffin & Crane immediately. They understood that we wanted to go modern, but not too modern. Our kitchen and dining room are beyond our expectations; we could not be happier! Giffin & Crane continue to provide us with excellent follow-up service, and we will most definitely use them again. Since 1986, Giffin & Crane have worked to build an extraordinary community one home at a time. The company's co-founders, Bruce Giffin and Geoff Crane recognized they could build and remodel fine homes for special people better together, than apart. Building on that trust and understanding, they formed Giffin & Crane, General Contractors LLC. 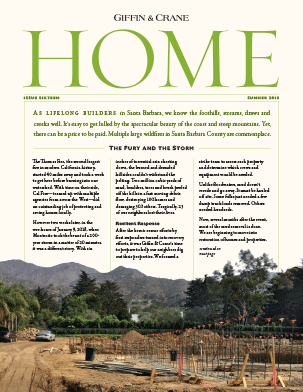 As lifelong builders in Santa Barbara, we know the foothills, streams, draws and creeks well. It’s easy to get lulled by the spectacular beauty of the coast and steep mountains.